First Lessons Mandolin teaches the absolute basics of learning to play mandolin from holding the pick to performing easy mandolin tunes. It doesn't get any easier than this! 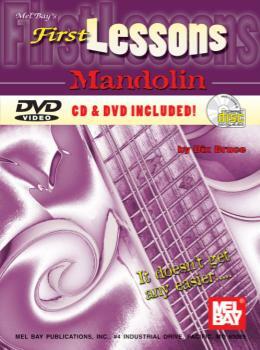 Students learn how to hold the mandolin correctly, how to read mandolin tablature, basic note reading, the most popular mandolin chords, how to play easy melodies in several musical styles, basic picking technique, how to tune the mandolin, and much more. Along the way students will learn about the greatest mandolin players and their music. The main emphasis of First Lessons Mandolin is to get the student up and playing immediately and to have fun doing it! A companion CD and DVD are included. DVD 139:00 minutes.